Ciara Mageean maintained her impressive run of form on her return to action after injury as she finished a superb third in the women's race at Saturday's Fifth Avenue Mile in New York. Mageean was ahead of several big names as she finished behind former 1500m world champion Jenny Simpson and another American Brenda Martinez. Those behind Mageean included other US stars Morgan Uceny and Mary Cain. Mageean was also in front of Britain's Hannah England. 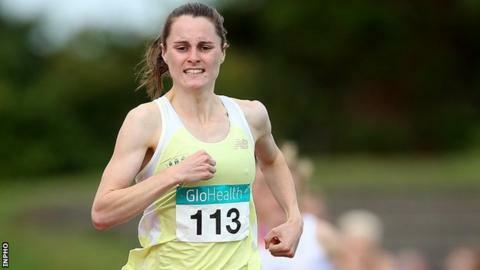 Portaferry woman Mageean finished ahead of England last weekend when she took second place behind Laura Muir in the mile event at the GreatCityGames meeting in Newcastle. Mageean clocked 4:21.2 in Saturday's race in the Big Apple which left her behind Simpson [4:19.4] and Martinez [4:19.6]. This year's Irish 1500m champion held off another American Heather Kampf [4:21.4] to clinch a third spot which earned the Northern Ireland woman a cheque for just over £1,500. Norway's Ingvill Makestad Bovim [4:21.9] took fifth ahead of Uceny [4:22.0] and England [4:23.1] with Cain [4:25.5] having to be content with 10th spot. Her victory at the Irish Championships in late July marked Mageean's return to the track after a two-year period wrecked by her ankle problem. Mageean, who is now coached by Jerry Kiernan, is now expected to focus on preparing for a challenge at the European Cross Country Championships in December. Also in New York, Ireland's Paul Robinson finished an impressive third in the men's race. Robinson clocked 3:51.1 which left him inches behind American winner Jordan McNamara [3:51.0] and another home athlete Garrett Heath [3:51.0]. Kildare man Robinson, who finished fourth in the 1500m at the recent European Championships in Zurich, finished ahead of a number of world class performers including fourth-placed Kenyan Augustine Choge [3:51.2] and American Matt Centrowitz [3:52.4]. Corkman Ciaran O'Lionaird clocked 3:54.3 to take 10th place.